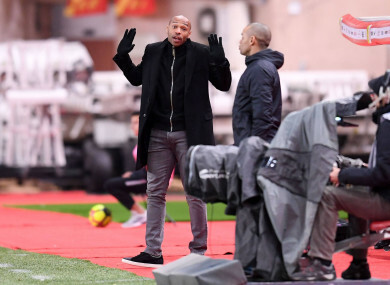 Thierry Henry's side are in horrendous form, losing 5-1 at home at the weekend and 3-1 tonight. MONACO SAW THEIR season take another turn for the worse with a shock 3-1 home defeat by Ligue 2 Metz in the French Cup Tuesday on a sombre night for football in the country after the suspected death of former Nantes striker Emiliano Sala. A minute’s silence was held before the last-32 game in tribute to Argentinian Sala, who is missing after a light aircraft he was travelling in disappeared over the English Channel just three days after his move to Premier League club Cardiff City. Nantes’ Cup game against third-division side Entente Sannois Saint-Gratien was postponed from Wednesday until Sunday. Elsewhere, Lille, second in Ligue 1, edged out fourth-tier Sete 1-0, while last season’s surprise finalists Les Herbiers bowed out to third-tier Villefranche with a 2-0 loss. Email “Woeful Monaco dumped out of French Cup by second-tier Metz”. Feedback on “Woeful Monaco dumped out of French Cup by second-tier Metz”.